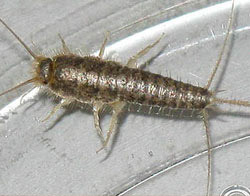 Silverfish are typically brown to silver in color and covered with scales. They are sometimes called bristletails because of their bristle-like tail appendages. Silverfish have wingless, flat bodies and move quickly. They are mostly nocturnal, hiding out of sight during the day. Silverfish feed on a variety of items, mostly paper products, including: glue, clothing and food items, book bindings, wallpaper, linen, rayon and cotton fabric. Silverfish do not transmit disease and are not a health concern, however, silverfish can damage a variety of items and can contaminate food. Silverfish may be introduced into a new location through other infested items, such as cardboard or books. Silverfish prefer moist areas with high humidity levels, such as bathrooms and attics, but can be found in other areas of homes and businesses. AmeriGuard Pest Defense provides silverfish control services. Our licensed service technician will perform a thorough visual inspection to identify the severity of your silverfish problem. During the inspection, all sources of the silverfish infestation will be identified and methods of silverfish treatment will be discussed. Effective silverfish control can be further improved with the assistance of our customers. Below are a few tips a homeowner can perform to reduce the likelihood of a silverfish infestation. Contact your silverfish service experts at AmeriGuard Pest Defense by calling (951) 652-0505 for a silverfish treatment quote. Most quotes for residential silverfish services can be provided over the phone without any obligation. Catching a silverfish infestation early will ensure that it is taken care of quickly and efficiently. No contracts required!